Treemont Retirement Community was the first Continuing Care Retirement Community (CCRC) in Houston and is proud to have now served multiple generations of satisfied family members. Treemont has a non-discriminatory policy based on race, creed and color. The retirement home in Houston, TX is family-owned and operated which affords direct involvement by the owners with the daily operation of community for the benefit of its residents. Treemont is a special place due to its long-tenured, caring staff, many of which have 20 or 30+ years of service. We have staff that have made a decision to return to Treemont for their own retirement. As we celebrate our 40th year of service to the community, we welcome you to visit and see why residents call Treemont home! Please feel free to click on the links below to meet our Executive Director, Activities Directors and other members of our Independent Living and Assisted Living Houston, TX Leadership Team! Click here to read about Treemont News & Events, including stories in Houston Chronicle. 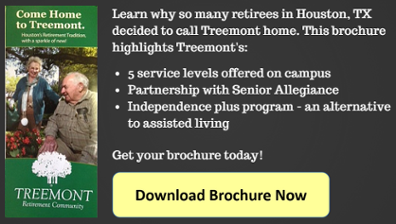 TREEMONT RETIREMENT COMMUNITY — Learn More!